•	Library is a heart of institute. 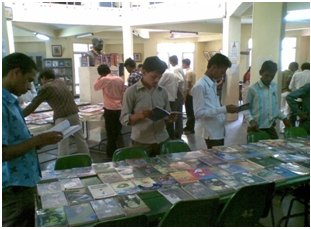 •	Teaching and learning system are supported by library through reading material. •	Our Library is well equipped. 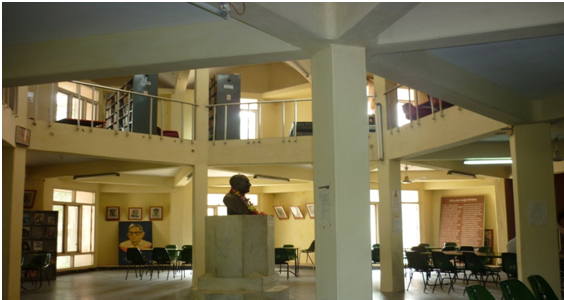 •	Library building is situated in the middle of the institute. 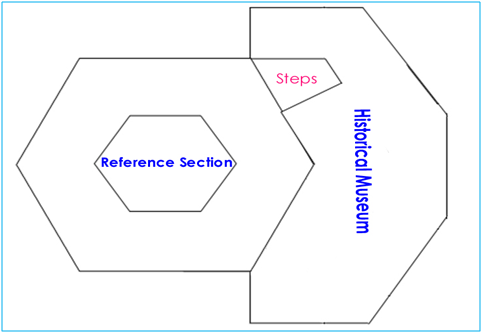 •	The total area of the library is 12000 SFT. We are happy to put here that our college as well as our library are playing a significant role in filling this vacuum in this forsaken rural area, NAGARAM. 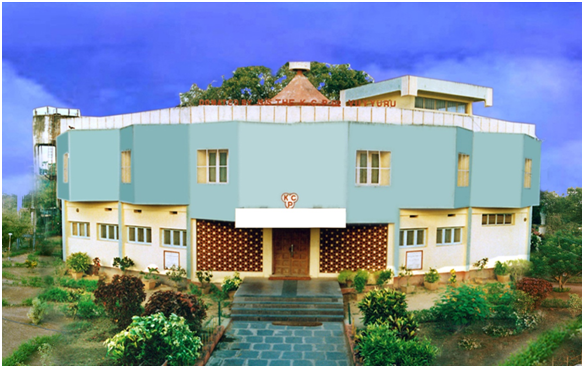 Our Library, located in a total rural backdrop, inhabited mostly by scheduled caste and backward class people, came into existence in the year 1969. 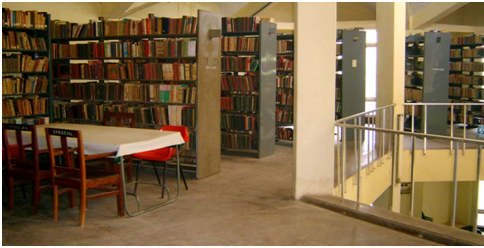 The College and the library transformed the educational scenario of this backward area. 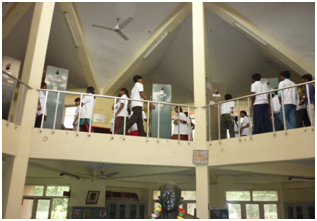 The students of these rural surroundings have been immensely benefited from the Library. It literally helped to ignite their minds. 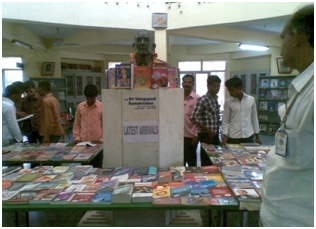 The founder Secretary & Correspondent Dr.N.V.Krishna Rao and Sri K. Uma vara Murthy are the architects of the Library. They are great book lovers. They are responsible for collection of invaluable books for the library. And also they donated precious books to the library. The pride of our college infrastructure is our “magnificent library building and the invaluable volumes in it”. The Library building stands majestically as a focal point amidst a beautiful garden with sylvan surroundings. There are numerous plants encompassing the building from the heat of the scorching sun. The flowering plants, the sylvan surroundings and the landscape of the college campus visible through the glass panels of the library building gives a veritable feast to the eyes of the readers at the library. Nearly four decades ago, to put precisely in the year 1969, the College and the Library were started with a noble mission to kindle light into the lives of the poor people of this forsaken backward area by imparting education. Thus in that year a tiny 40’ x 12’ asbestos roofed building was earmarked to locate the Library. This building was constructed way back in the year 1983 itself at a stupendous cost of Rs. 13 lakhs. The KCP Ltd., Vuyyuru, the pioneers in sugar manufacturing, are the munificent donors of this magnificent landmark, along with the furniture. The chairs and tables are fiber make. The racks are from ‘Godrej and Vinar’. We also have catalogue cabinets and the process of computerization of Library stock has been taken up by using ‘Soul software’. The reading room has capacity to seat 150 readers. The total plinth area of the building is around 12000 sft. 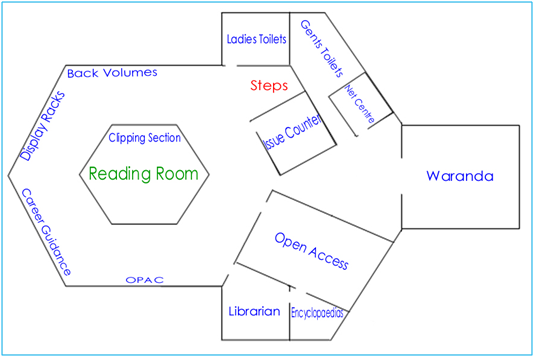 The ground floor is consisting of reading room, reference room, stock room, issue counter and the Librarian’s room. The first floor is also used for the stocks as well as reading room. The Library has a most unique annexure to it - an ‘Archaeological Museum’. Several photos, portraits of eminent scholars, Literatures , noble personalities and philanthropists adorning the walls of the reading room, shower inspiration to the young minds. The noble mission of our library is service oriented. We provide open access system, audio, video services and display of clippings of different items. We always guide students and staff in the selection of worthy and right books to study. 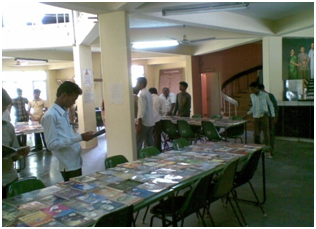 The ambience in the library helped to organize various seminars and debates by faculty for the benefit of students. Open access: The open access system facility is available for both degree and intermediate students. 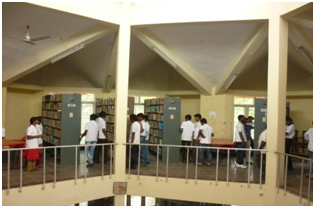 Book bank facility: Book bank facility is available for the economically backward students. Back volumes: Back volumes facility is available for the reference. We are preserving back numbers of college magazines, and important Journals in bound form. Question papers of previous years are also available for the students in the reading room. Clipping section: We are collecting important articles of different kinds from News papers and magazines. The clippings are orderly filed and pasted in categorical manner. We are glad to put on record that this service has immensely helped the students and staff to prepare themselves for competitive exams, debates, seminars and also for participation in competitive events. Automation: The library is partially automated. The collection of books is computerized and this computerized catalogue is made available for staff and students (OPAC). On-line Journals: Staff and Students can have access to more than 5902 e-journals and 804020 e-books under the N-List program of INFLIBNET. 1. Circulation Services: The UG Library circulates books, CD’s & Audio Cassettes among the students and staff for the scheduled period of time. This service improves the subject and general information of the users. 2. Paper Clipping Services: Newspaper clippings pertaining to the news covered in Earth Sciences, Life Sciences, Social Sciences and Languages are collected and sent to all departments .Details of English Vocabulary from Newspapers and Magazines are documented. 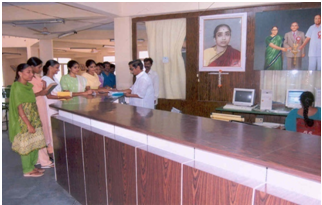 3 .References / Referral Service: The Library provides Reference Hall for teachers and students. A good number of books are available for reference purpose. Users are also guided on referral services. 4. Information Display and Notification Services: Our library display paper clippings from news papers, periodicals and journals. It also displays notifications and placement details for the benefit of the users. 5. Photo Copying and Printing Services: Provides photo copies of subject & general information at a subsidized cost on demand for the students and staff. 6 .User Orientations / Information Literacy: It helps the users to get right information at the right time. It helps how to prepare for the competition and academic examinations. 7. Power Backup facilities: The College is equipped with a Generator , solar power and UPS..
8. Text Book Service: It provides a good number of text books to the students as most of them come from rural areas and belong to socially and economically underprivileged sections. Library uses the card system in the issue of books. Books issued to the students can be retained for a period of 15 days and can be renewed every fortnight, if necessary. The books are issued to students and staff on all days of the week. 9. Reading Room Service: The Library provides a spacious reading room for periodicals, news papers, magazines and reputed journals. Interested readers can refer to the back volumes also. Reading Room covers 3 languages spheres i.e. 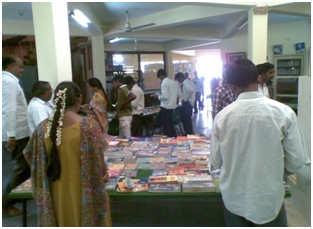 Telugu, English and Hindi Reading Room provides news papers, magazines, Journals. Etc..
10. E- Library (Internet Facility) In addition to Books and CD’s our library provides Internet access for the students free of cost. Enables Research scholars retrieve information from Internet. 11. INFLIBNET: The Library has access to e-resources through a programme entitled “National Library and information Services Infrastructure for Scholarly Content” (N-LIST). This is a programme funded by the Ministry of Human Resources Development under its National Mission in Education through Information Library Network centre an autonomous Inter-University Centre of UGC. This N-list programme provides access to more than 5000 e-journals (including current issues with 10 years back files) and 80,409+ e-books. Thus the students and Faculty members have access to Scholarly Content available in open access through subject portals and subjects gateways. 12. CD Library: Library has a collection of CD’s on different subjects. 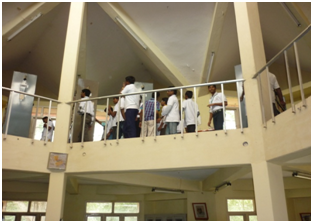 They are issued to the interested students and staff for their use. 13. Careers and Courses Service: Library displays newspaper clippings on career opportunities and availability of courses in different disciplines on a display board. A separate section is maintained for the benefit of the students and clippings are documented afterwards. 14 .Thought of the day service: Library provides a display board on which “Quotable Quotation” is written daily to inculcate moral values and sensibilities among the students. 15. Back volumes Service: A separate section is maintained for the benefit of the students. Old magazines and journals are documented afterwards. (1) J.K.C College, Guntur. (2) A.B.R Degree College, Repalle. (3)K.V.R & M.K.R College, Khajipalem. 17. Readers club: Library has volunteer opportunities for students, who wishes to do community service. Monday to Saturday	09-00 a.m. to 05-30 p.m.
Open access timings 02.30 p.m. to 05.30 p.m.
During the vacation 10.00 a.m. to 01.00 p.m.